There has been talk for months now that Apple and News Corp. would hold a joint event in the Bay Area to announce the launch of The Daily, the iPad-only publication. Then a few wrenches were thrown into the mix. First of all, Apple supposedly needed a little more time to get their subscription service working in a new version of iTunes. And then, of course, Apple CEO Steve Jobs announced he was taking an indefinite leave of absence. Given that The Daily has been a project watched closely by News Corp. CEO Rupert Murdoch, you can be sure that he wanted Jobs up on stage with him to present it to the world. That’s clearly not going to happen now. So News Corp. likely had to switch things around. And today they have. An invite has just gone out to the press, notifying us of an event to launch The Daily . Rupert Murdoch is clearly taking control of this event — his name is in the large font on the top of the invite. 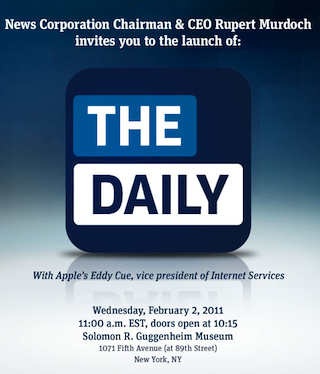 Apple is obviously still sending someone, but it will be Eddy Cue, vice president of Internet Services, rather than Jobs — Cue’s name appears smaller below The Daily’s app logo. Further, the event has now been moved to News Corp.’s homebase of New York City (it will be at the Guggenheim). And it’s set for next week, February 2. Cue is an interesting choice for Apple to send if, for no other reason, than he normally doesn’t take the stage. When Jobs isn’t on stage, it’s usually SVP of Marketing Phil Schiller, COO Tim Cook, or sometimes SVP of iOS Scott Forstall, or SVP of Design Jonathan Ive that gets the spotlight. Cue isn’t even technically an executive (just VP). But Fast Company did last year highlight the longtime Apple employee as the number two most creative person in business (behind only Lady Gaga). And iTunes and the App Store are his babies. If anyone is going to be able to explain why the iTunes subscription model will work where others have failed, it’s Cue.